Popular coffee beans six and four types of classic, it has a whopping 10 types in accordance with the drip bag coffee. Each 10 bags a total of 100 bags. Because this only of the type and volume, that of course in the choice is the mood of the day, issues to be served a cup of coffee in your favorite Osusowake and customers. It is fun to receive choose on your own? Exactly, it is a special variety of bags. Blue Mountain blend revival. You can enjoy in the variety lucky bag. Blue Mountain blend drip bag coffee drip bag coffee four classic. - Deep, rich flavor premium blend "killer whale blend" drip bag coffee floral fruity Guatemala 100% drip bag coffee, fine deep aroma and flavor of the drip bag coffee-rich aroma mild drip bag coffee and in the popular blend coffee beans two types appeared in the drip bag. 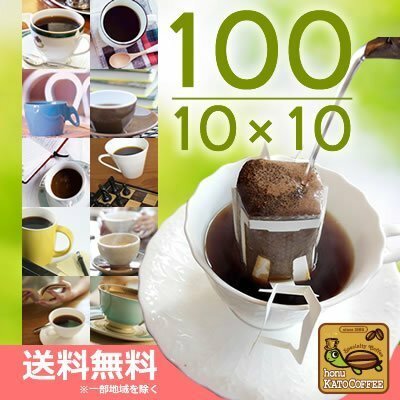 Kok and the sweet and sour taste Golden blend drip bag coffee, a little luxury premium blend, and gold in harmony coffee drip bag coffee Furthermore, OR deliver a drip bag coffee 2 types of the world standard Q grade specialty coffee was used 100% you. - Rich flavor and good acidity world standard Q grade Colombia drip bag coffee Kaoru flavor and firm bodied world standard Q grade Brazil drip bag coffee 10 kind eyes of drip bag coffee, a little mystery cup of Excellence drip bag coffee cup or of Excellence of the drip bag coffee any country Cup of Excellence coffee thing is a secret. Please wait and reasoning to arrive at hand. If you have any questions about this product by honu Kato coffee shop, contact us by completing and submitting the form below. If you are looking for a specif part number, please include it with your message.